Interested in replacing your water heater? The electrical contractors at Hot Water often get asked about the benefits of investing in a high-efficiency water heater. High-efficiency water heaters operate at over 90% efficiency. If you have a gas water heater, for example, the system will use 90% of the gas to heat the water, whereas traditional water storage tanks operate at closer to 80%. These water heating systems also modulate. If you only have a single tap or shower running, for example, it will modulate down so that the system isn’t firing at full capacity. This will save on fuel and electricity and thereby result in even greater financial savings. The latest high-efficiency hot water heaters are more ergonomic than traditional units. While older water heating systems are generally installed in basements and take up a relatively large amount of space, the newer systems have been designed to be more compact. Some of the units are also designed to hang on the wall, which can free up even more space in your home. Many of the high-efficiency hot water heaters that we install are about the size of a suitcase, to give you an idea of how much space your new unit might occupy. 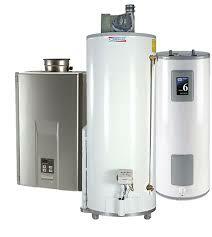 If you are ready to invest in a high-efficiency water heater, then call the experts at Hot Water. We service the entire Panama City area.